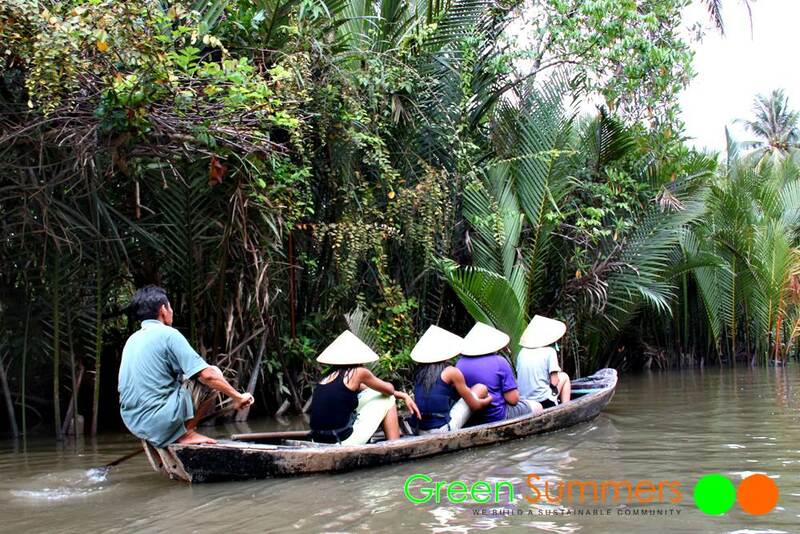 Mekong Delta Vietnam is a so beautiful place with green nature and distinct daily life. 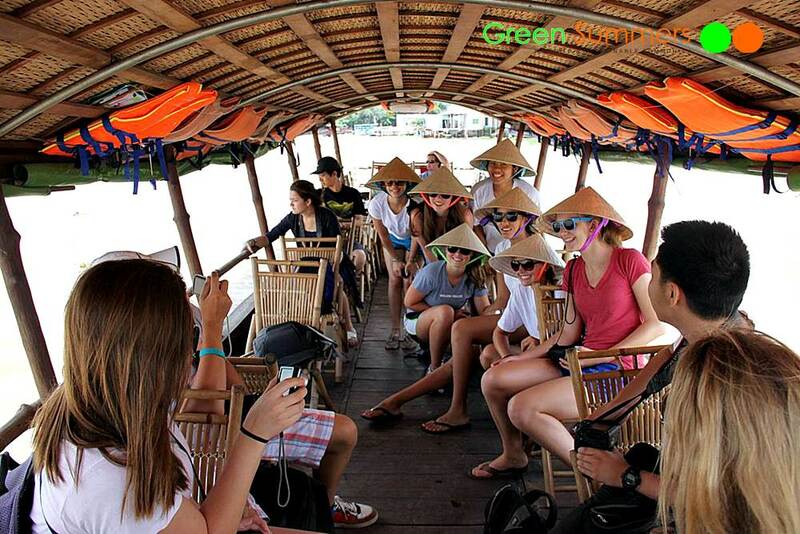 The Vietnam School Tour Mekong is then the must do tour for groups coming to the South. 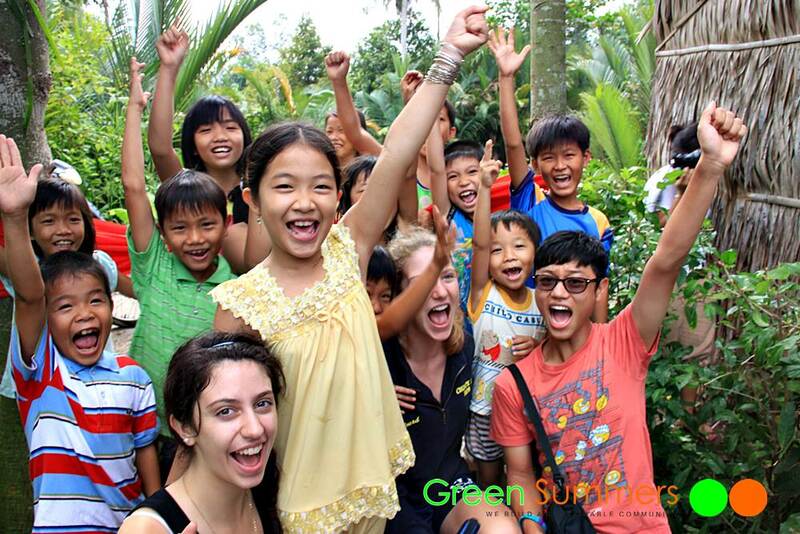 Some of our programs includes community service project in Mekong, and that’s wonderful. 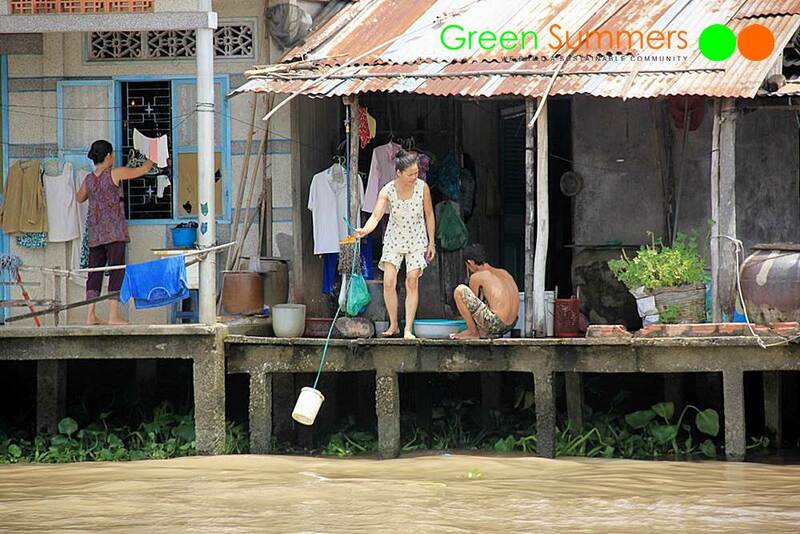 We have full time integrating into the green beauty of Mekong, as well as touching the the culure of mekong people. This is also one of the poorest area in Vietnam, then the community services are true helps to change the lives of local people. 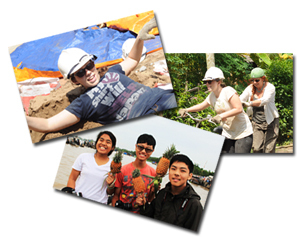 In some programs we have community services at other places, we also visit Mekong in one day. Then we can enjoy the special highlights of this land. Mekong Delta in Vietnam is a land of maze of canals. The main river separates into 9 rivers like nine dragons in the local legends. Canals from those 9 rivers make lush beauty of the land. 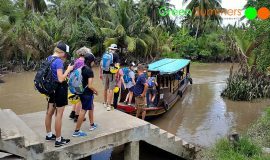 Boating into the canals in a Vietnam School Tour Mekong is great experience then. 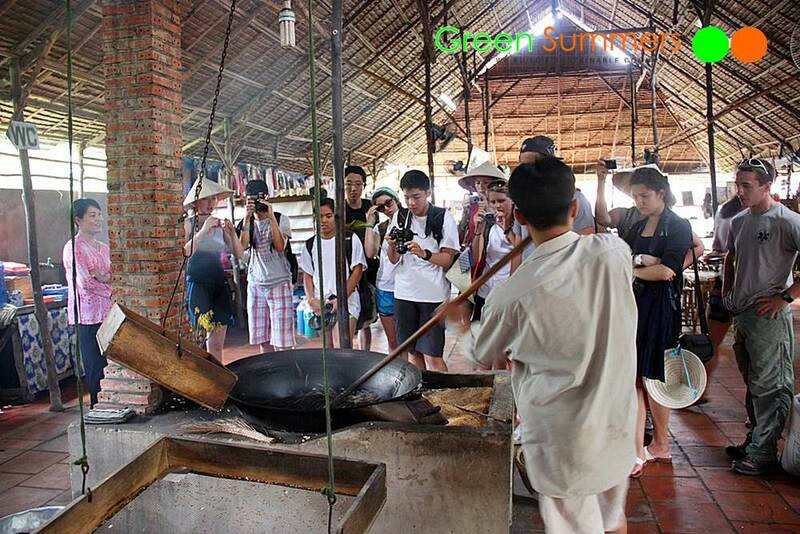 In this picture, students wear the conical hats which are a traditional hats of Vietnamese women. 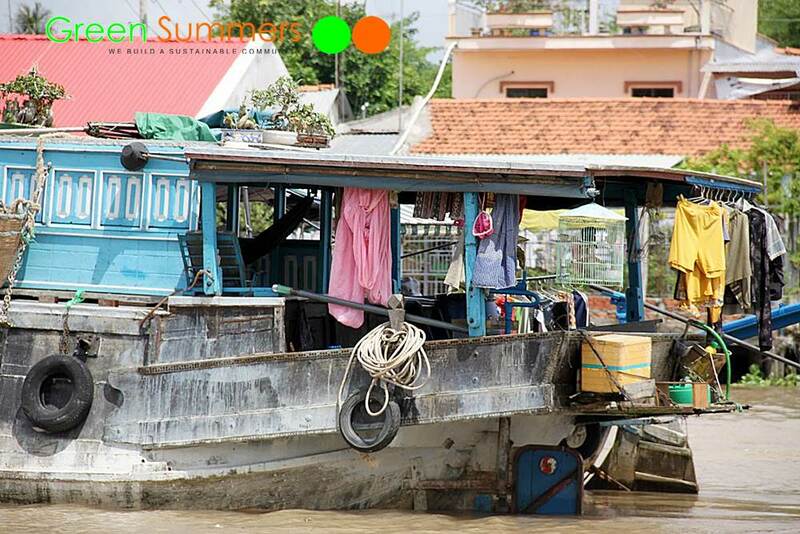 What can students see along the cruise at Vietnam School Tour Mekong ? 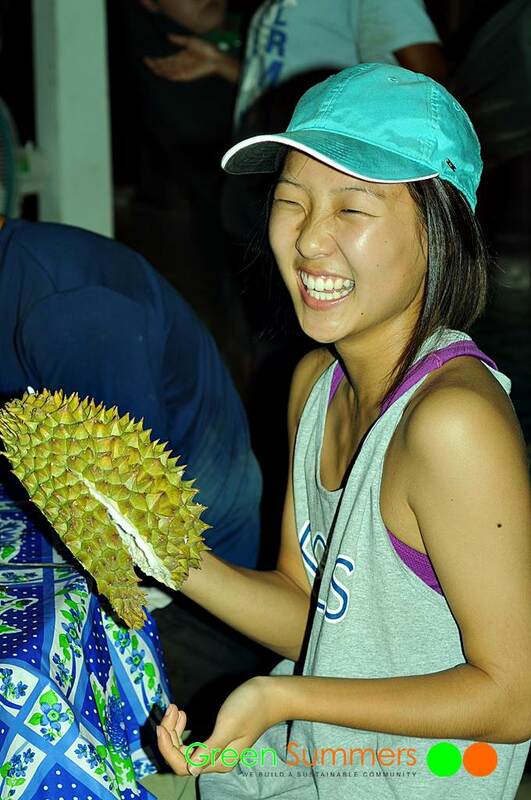 Firstly, among that background of canal life, students can visit the floating market which are places many boats gathering on the river to buy and sell and barter fruits and vegetables from their gardens. Students can learn stories of mobile lives on these boat, especially chidlren, which poor condition of education. Enjoying the amazing beauty of the floating market, students also get touched with the stories of lives. Seeing floating market, we need to sit on small boats going into the crowd of those thousand boats and see the bargain and exchange happen. Secondly, faces of children along the cruise make bright side of the experience. 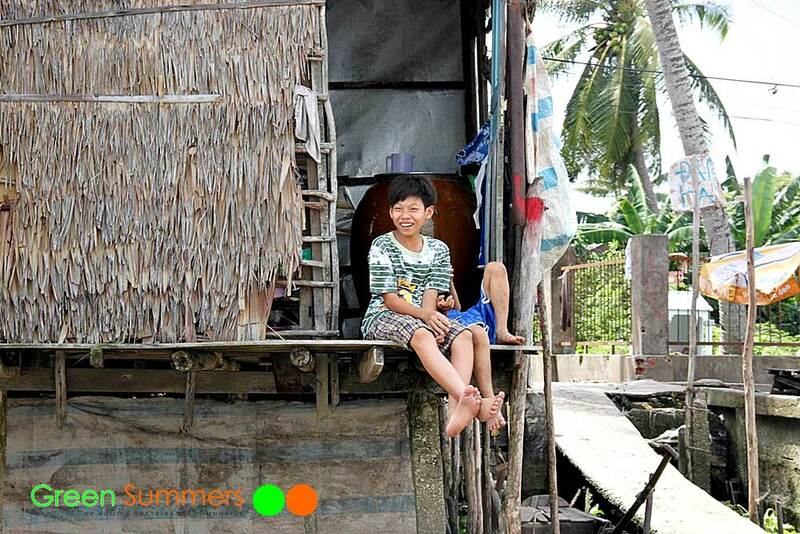 Among the poor houses with limited condition of living, we even see the most sparkling smiles. The happiness can be transferred from the poor children to our students. Thirdly, seeing life along the cruise is a better lesson than any in the classroom. We can see people do housework. We can see them do business. The exposure can be also hygen condition of life, family daily life activities, fishing from the river, ferries and the local etiquettes, etc. Those are real beauties that not any book of culture introduction can be better. 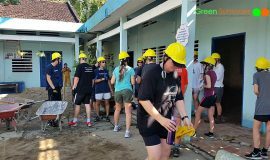 Forthly, visiting local businesses in a Vietnam School Tour Mekong is an opportunity to understand more about locla life. 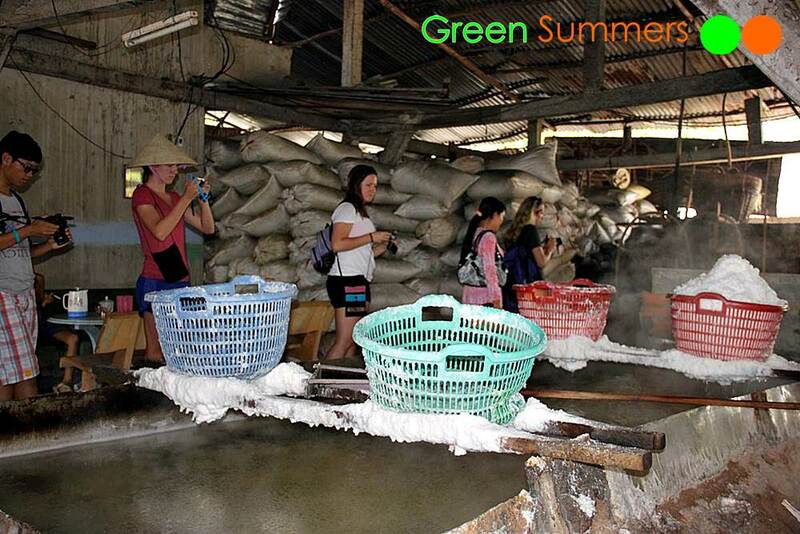 In addition to having income from fishing, from rice farming, students can see how the local earn. 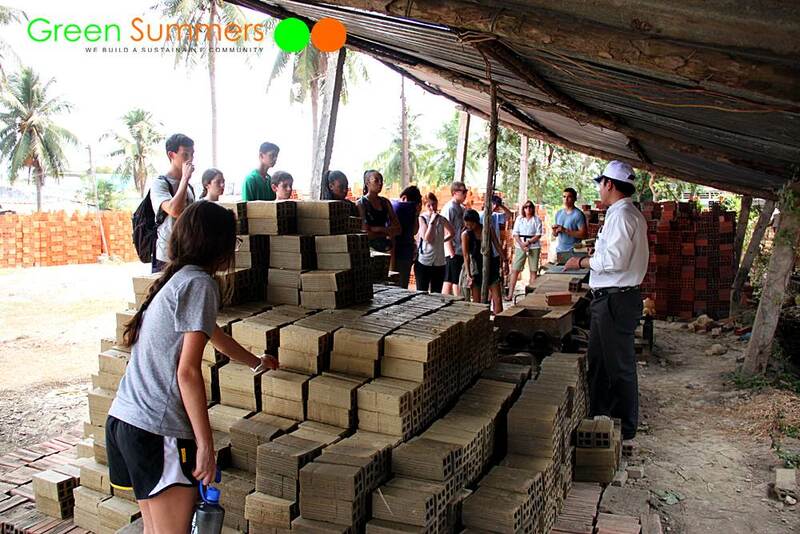 Students can visit a brick factory and learn the whole process of making brick in Vietnam, especially with material and techniques from local experts. Experiencing Vietnam School Tours, students can eat alot of foods from rice, especially noodles. Visiting such a factory making noodle is also able to amaze students. How about popcorn? Do Vietnamese eat popcorn at cinema? We probadly don’t and we use rice instead. Visiting a family making poprice is also great chance to understand local snack. We can see how they we roast rice, how we process with a three generation business. We also can sit down and enjoy those beautiful sweeties among the atmosphere of Vietnamese house. Fifthly, Mekong canals are full of water cocot nut. Having a sampan rowing along these peaceful canals and being away from noise of modern life makes the most tranquil feeling of getting lost in nature. 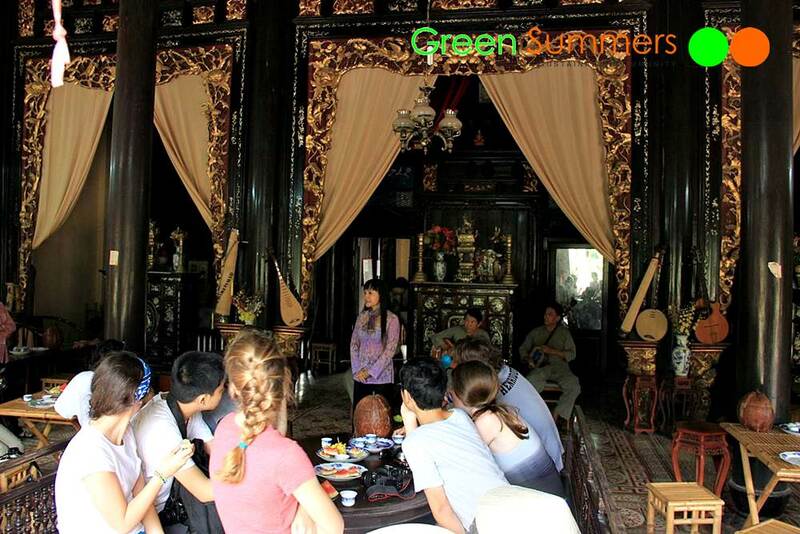 Sixthly, our Vietnam School Tour Mekong can stop at a locla house and enjoy folk music of Mekong people that has been acknowledged as Immaterialism World Hertage by UNESCO. We might not understand the lyrics of the songs, but we enjoy the melody as well as ways Mekong people act via scenes at the music show. Seventhly, we think visitting local house are of most discovery feeling for our students. We touch true local life and we meet cuties like in the picture below. 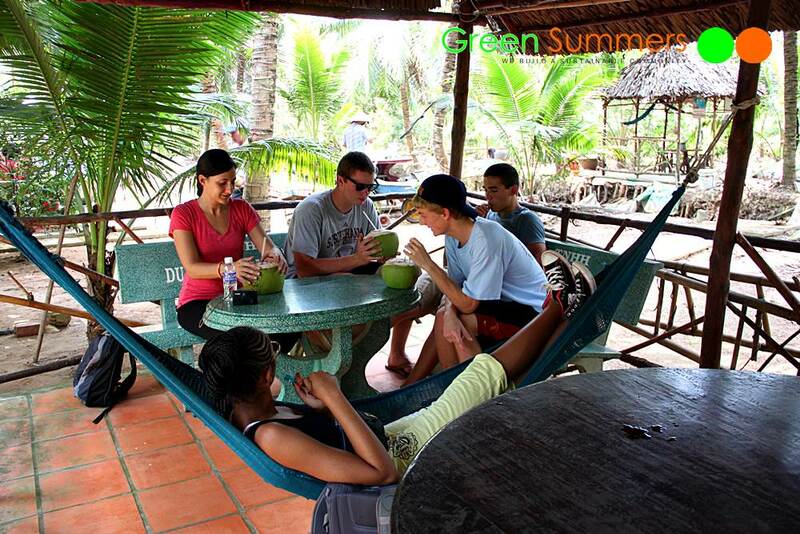 Among our walking and cycling along trails at Mekong delta Vietnam, we can stop any where at a locla house and drink some very fresh coconut from them. We can relax but still discover daily life around, even just by endulging yourself into a hammuck and looking around. Last but not least, it’s so beautiful to interact with local kids. Some are poor and some are better. However, they will come around with smiles. Though langguage can be a barrier but we believe cobversations are not big problems at all. 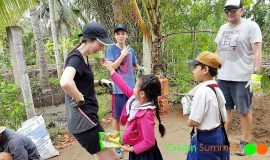 Vietnam School Tour Mekong trip is of more things to discover. Don’t miss this when coming to South of Vietnam in your once for a life time trip. Looks so adventurous and fun. Drinking tender coconut water, eating durian playing with kids… all so much of fun. Looks like a really great tour! Awesome that you get a feel for life on the Meekong and interact with the kids! 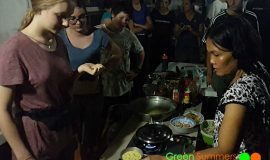 Looks like a super fun and educational tour, I would love to visit a floating market and learn about poprice (and eat it too!). Besides, that piglet is super cute, haha.